Clear bell-like sound with a full tonal color pallet. With age and playing, the guitar becomes warm and rich. To me, European Spruce produces the most sophisticated tonal range of all the top woods. Very similar to European Spruce but with a more immediate open sound. The color pallet tends more towards the fundamental, yet Englemen Spruce also becomes warm and rich with age. The most sonorous of all the top woods. Red Cedar produces lots of sustain and creates a warm rewarding sound especially for the player. Its projection is not as direct as spruce, yet it still fills a hall with sound. The king of woods for the ultimate guitar. It has a color pallet like no other rosewood with a warmer, richer sound and a bell like clarity that most other rosewoods lack. Truly a more sophisticated sound. To me the only other rosewood that can give Brazilian Rosewood a run for its money. 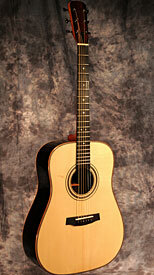 It is very similar sounding to Brazilian Rosewood but a little denser in overall tonal character. A very fine wood that tends to favor the fundamental tones of the guitar. To me East Indian lacks the tonal color that the other two rosewoods have yet when used with a cedar top, it produces a resonant sound. 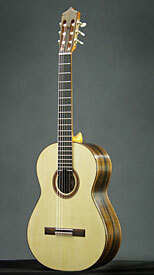 A great tonal wood for either flamenco or classic guitars with a very earthy rich sound. It lacks the dense body that the rosewoods have simply because it is a lighter weight wood, yet it makes up for it in its immense character.